This is my second trip to Tokyo, the first one being in April last year when I made a rather hastily cobbled together visit. This year, despite having had less notice (I only found out I was going at the start of June and only had confirmation four weeks before I flew on July 13th), I managed to do a little bit more planning, although the end result was a much less ambitious trip, where I stayed in Tokyo for the two weeks I was there. Both times I flew with British Airways, last time in economy (World Traveller) and this time, since I had the money in the travel budget, in business class (Club World). As I’ve been doing the last few times I’ve travelled, I flew to and from Manchester so that I could visit my 85 year old Dad before/after the trip. This meant taking the short hop down to Heathrow and catching a direct flight to Tokyo from there. 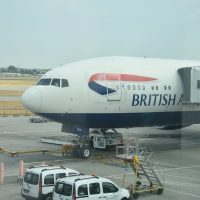 It was also the first time I’d flown with British Airways since it started serving Union Hand-roasted coffee in its lounges and in Club World and First Class cabins, giving me the chance to try it out. You can read a little bit about the trip after the gallery, a summary of my two weeks in Tokyo. I started this post by saying that this was a much less ambitious trip than my first visit in 2017. The main reason for this was the weather: Japan in the summer can be hot and sticky and, rather than travel around like I did the previous year, I decided to spend my time in Tokyo, where I was working for a week, then stick around for another week of sight-seeing. It also helps that I’m going back in October, when it’s cooler, so I can travel around then. This turned out to be an excellent choice: my two weeks in Japan coincided with the hottest heatwave on record and while it was hot and sticky in Tokyo, it was even worse further west, where I had planned to go. During my two weeks, the daytime high was never less than 29⁰C and it frequently reached 34⁰C, while it never fell below 24⁰C at nights. As result, I spent my time shuttling around between coffee shops and other air-conditioned places, generally taking things easy. When it came to the flights, I was a little bit inconvenienced by having to book relatively late in the day. The first thing to say is that compared to flying to the likes of Vietnam, China and Thailand, flying to Tokyo is expensive. Last year, when I flew World Traveller, the total cost came to an eye-watering £1,300 and that was booking three months in advance. This year, since I had the budget, I flew Club World at an even more eye-watering £3,660, although I could have spent an awful lot more if I’d booked the flights I’d actually wanted. Tokyo has two international airports: Narita, which is way out to the east of the city on the other side of the bay, and Haneda, which is much closer, just to the south of the city on the bay’s western shore. Although the majority of international flights go to Narita, British Airways has one flight a day to each. Last year, I went to Narita on a very swish Boeing 787, the flight leaving at 15:45 and arriving the following day at 11:15 which means that by the time you get to your hotel from the airport, you can check in. The corresponding flight back leaves Narita at the civilised hour of 12:55. The disadvantage with catching a flight leaving Heathrow at 11:40 is that since I was starting from Manchester, I had to catch the 08:40 flight to Heathrow. Anyone who knows me will be aware of my intense dislike of mornings, so I was less than impressed that I had to leave my Dad’s house at 06:15, catching a taxi to the airport. Regular readers will also know that whenever I go to Manchester, it always rains, so it came as no surprise when, during the middle of a long, hot summer, I was driven to the airport in the filthiest weather imaginable, the rain coming down hard almost as soon as we crossed over into England. After 25 minutes, things started moving again and by 07:40, I was checked in and off to see my old friends at the over-sized bag drop counter, which had cunningly moved since the last time I flew down to Heathrow, from the right of the check-in desks to the left… I’m sure they only did it to confuse me. Although the delay was annoying, it wasn’t too bad, and, in British Airway’s defence, as I walked back past the check-in desks having dropped my bag off, the queues had almost gone, which was impressive. This was the first time I’d flown from Manchester in Club World, so was able to use the fast-track security lane. I wasn’t even stopped to have anything checked and, as a result, I was through security by 07:50 and into the lounge by 07:55. You can see what I made of the flight after the gallery. The flight was called for boarding at 08:00, so I grabbed a cinnamon bun to eat on the plane and headed down to the gate, where, for once, I was able to use my priority boarding to skip the queue and head straight onto the plane, an Airbus A319. Normally I try to get a bulk-head seat on these flights, but these had already been taken when I booked, so I went for a window seat instead (3F), reasoning that I could survive the lack of leg room on such a short flight and enjoyed the views instead. As it was, the weather put paid to that idea and, once boarding was complete (08:20), the plane was about half full. I could see that one of the bulk-head seats (1D) was empty, so I asked if I could move up, where I enjoyed some decent legroom. We pushed back early at 08:30, with the pilot estimating that we’d spend 15 minutes taxiing to our take-off position, with another 30 minutes actually in the air on the way down to Heathrow. The first part of his estimate turned out to be pretty accurate and we took off at 08:45, the cabin crew impressing me by managing to fit in a full meal service in Club World. This started at 08:55 with drinks, and, having missed out on coffee in the lounge, I ordered a cup, but somewhat regretted it (the Union tie-up is only for long-haul flights). Breakfast was much better, with fruit and a warm roll, plus yoghurt, served in record time and cleared away by 09:15, which, if the pilot’s initial estimate had been correct, would have been about when we landed at Heathrow. As it was, we had to go around once and the seat-belt signs came back on at 09:20, the cabin crew taking their seats for landing at 09:25. Heathrow was shrouded with low, thick cloud and we landed from the west which is unusual (flights typically land from the east). We were on the ground by 09:30 and shortly after that at the gate and off the plane by 09:40, leaving me two hours to kill before my flight to Tokyo. The first few times I flew via Heathrow, I was connecting to flights leaving from Terminal 3, which is a bit of a faff. However, as I noted when I flew to Boston earlier this year, connecting at Heathrow’s Terminal 5 is a whole different ballgame. Rather than having to catch a bus to the other terminal and then go through security, you come off the plane, go to flight connections, get your boarding pass checked and walk straight into the departures area of Terminal 5. I think almost everyone on my flight from Manchester was connecting to another flight (seriously, does anyone fly from Manchester to London, with London as their final destination?) so there was a short queue at flight connections, but that was it. Within five minutes of getting off the plane, I found myself in the departures lounge, heading up to the north lounge. Ironically, my flight departed from Gate B48, so I would have been better of going for the lounge in the B gates area, but when I arrived, the departure boards didn’t even list the gate area. Annoyingly, the gate was actually printed on the boarding card which I was given in Manchester two hours earlier, which rather begs the question why the gate couldn’t have been displayed on the departures board? As it was, I found myself in the spacious and busy north lounge which occupies the full width of the northern end of Terminal 5. It’s T-shaped and you enter at the bottom of the T, where there is coffee, etc, and cakes, plus some seating. However, the bulk of the seating is at cross part of the T, where you’ll also find the food off to the right. British Airways offers light meal options, with breakfast being served while I was there. This included bacon rolls, spinach & mushroom frittatas, baked beans, hash browns and that sort of thing, while there were also cereals, toast and pastries. There is more seating off to the left, where I ended up, including a series of long window-bars overlooking the gates and the north runway, while at the far end there’s a second coffee station, a business area (the lack of power outlets in the rest of the lounge is disappointing) and a children’s play area, right next to the business area, a shocking piece of design! I took the opportunity to sample the Union Hand-roasted coffee which was pretty good, as well as have a hot breakfast. Then I did a little work, before it was time to head off to the gate. My flight was supposed to board at 10:40, and, typically, when I checked on the departure board at 10:30, nothing was shown. When I looked again at 10:50, the gate (B48) was up and the flight was showing as boarding. Normally, once you have your boarding pass scanned at the gate, the next stop is the plane. Not so with Gate B38, where the plane is at the end of a very long series of walkways that snake out across the tarmac. It all, it took ten minutes from having my boarding pass scanned from actually setting foot on the plane, a Boeing 777-300, about half of which was spent walking to the plane and the rest queuing on the air bridge. I’m pretty used to the British Airways Club World cabins, where the seats are arranged in pairs, with the aisle seat facing forwards and the window/inside seat facing backwards. There are two aisles, with one pair of seats on each side, and two pairs in the middle between the two aisles. The way the seats are arranged, when they are converted into beds, the foot of one seat touches the back of the seat in front, so if you have a window seat, or one of the two middle seats, you have to climb over the person outside you to get in/out of your seat. If you have an aisle seat, you can get in and out easily enough, but, of course, it means that whoever is in the middle seat ends up climbing over you, so that’s not ideal. The only exception is right at the front, where the person to your left/right is climbing over the seat behind you, so if you want an aisle seat, these are the best ones. Meanwhile, the worst seats, for me, at least, are the two seats in the middle of the middle pair, which is where I ended up the first time I flew Club World with British Airways on the way back from Chicago. These are rear-facing, with no divider between the two seats, which is great if you are travelling as a couple, but not so great if you are on your own. Although I booked my flight rather late, I was able to nab a great seat, 16A, which is by the window in the final row of the Club World cabin. This is right next to the toilets (there are four at the back of the cabin, two on either side) and while some people might find this a problem, for me, this seat, and its equivalent on the other side, are the best ones going. Not only is it a window seat, which I love, particularly because I always sit in aisle seats when flying in economy (the seats are just too narrow for me to comfortably sit next to a window in economy with someone sat next to me), but, since it’s the last row, you don’t have to climb over anyone to get in and out. Instead, access is via a (slightly tight) squeeze between the bulkhead and the back of the seat next to you. Given a choice, I always go for this seat and was delighted to be able to get it. The rest of the seat and its layout is pretty standard for British Airways, with a large, foldout table that slides back and forwards, so you can always get a good typing position, plus a power outlet which takes pretty much any plug. There’s also a couple of USB power outlets, one down by the main plug and the other up by the headrest. There’s a drawer under the table for storage and the usual flip-out monitor. Despite the long queues and only starting boarding at 11:10, we completed boarding and pushed back on time at 11:40 which was impressive. Then it was time to play the usual taxi games before we took off. Since I rarely fly with a window seat, the inordinate amounts of time spent taxiing around before take-off are some of my least favourite parts of any flight. The plane is locked down ready for take-off and so I can’t use my laptop and so I’m often left listening to a pod cast. However, give me a window (and my camera) and suddenly taxiing becomes fun and an opportunity to take far too many photographs. My view, from the back of the Club World cabin, was along the wing, which, I have to say, looked disturbingly narrow to support an entire Boeing 777-300 in flight… We left the terminal and joined two parallel queues of planes making our way to the western end of the southern runway, which, frankly wasn’t that far, but still took us 20 minutes. Various aircraft took off before us, including a Singapore Airlines Airbus A380, a Virgin Atlantic Airbus A330-300 and a British Airways Airbus A320. We took off at 12:00, heading east, then turned north, so had I been on the other side of the plane (I was on the left-hand side) I’d have probably had a good view of central London. We flew across Essex and over Suffolk, before crossing the Norfolk coast. I must confess that I really like flying business class. The service in economy is pretty good, but there are all these little touches in business class, like the hot towels that are passed around at the start of the flight and the big headphones you get instead of the little earbuds. The bedding even comes in a big zip-up bag. We were served a bag of nuts at 12:45 and then the crew came around to take orders for lunch at 13:00, although since I’m down as a vegetarian on my British Airways account, they already had a vegetarian meal put aside for me. By this time we were almost all the way across the North Sea, heading for Sweden, with Norway to the left and Denmark to the right. We crossed the Swedish (or quite possibly Norwegian) coast at 13:20 and 15 minutes later, our starters arrived. Being at the back of the cabin meant we got served last and, unlike in economy, when the vegetarian meals come out first, I was served along with everyone else. My starter was a goat’s cheese salad, which I ate as we left Sweden behind us and started across the Baltic (technically the Gulf of Bothnia), which took just 15 minutes, the Finnish coast arriving at 14:05, with the main course, a rather lovely spicy vegetable curry with sticky rice, arriving five minutes later. Dessert was another 30 minutes after that at 14:35, at which point we were probably somewhere over Russia. I followed that with coffee, my first chance to sample in-air version of British Airways’ Union Hand-roasted coffee and, while it was okay, I can’t say I was particularly blown away by it. I rounded things off with a glass of port, managing to get some cheese and biscuits to go it and, shortly afterwards, at 14:50, we headed out across the White Sea. Everything was cleared away by 15:05, the whole meal service taking about 1½ hours, a far cry from economy, where everything proceeds at a much more rapid pace. Even though it was still bright outside, this was the cue for lights to be switched off and the window blinds to be pulled down. I decided that I would try to get some sleep, having been up at that point for nine hours. I dozed for a bit, but woke up again at 16:20, at which point we were flying along Russia’s northern coast. Finally, I managed to drop off properly. You can see how the rest of the flight went after the gallery. This time I managed to sleep through to 19:00 and although it was only a few hours, it felt like a proper sleep. I got up, and went to the galley, where I made some coffee with my Aergrind and Travel Press, while I had a long chat with one of the cabin crew, Tony, who was fascinated by the whole process. By now it was twilight outside and we were still flying across Russia, just skirting the boundary between day (to the left/north of the plane) and night (to the right/south). The sun was just visible through the clouds and it was quite magical to look down on the tops of the clouds, seeing them lit by the sun from beneath. This lasted almost an hour, with the sun finally rising at 20:12. Meanwhile, back in the cabin, it was still dark, with the lights off and the blinds down, although I reckon no more than half the people were asleep. I did a little work and then went for another wander at 21:15, which was perfect timing since almost immediately the lights came on and the crew started the breakfast service. I got my breakfast just after we crossed the Russian coast at 21:30, consisting of a starter of fruit, a smoothie and some hot bread rolls, followed by a hot breakfast omelette at 21:55. Like my lunch, this was excellent, packed with vegetables and served with a tangy salsa on a bed of spinach. I also had a second cup of Union coffee which, I have to say, was much better than the first. By now we were approaching the Japanese coast and getting ready for landing, which you can read about after the gallery. We were pretty much on time, with our estimated arrival time of 23:00 (or 07:00 Tokyo time). The cabin was prepped for landing by 22:35 and the cabin crew took their seats for landing at 22:40. Although we were east of Tokyo and heading south, we ended up flying around to the north of Tokyo then down out across Tokyo Bay to approach from the west before swinging around to the north for our final approach. Sadly although I was on the correct side of the aircraft for some good views of Tokyo, we only broke through the cloud when we hit the bay. We were on the ground at 22:55, or, since we were now in Tokyo, I should say 06:55 and by 07:02 we were at the gate. I took my time gathering my things and getting off the plane, so I was pretty much the last one off at 07:10. From there, there was a long walk (much as there had been to get on the plane at Heathrow) to the main part of the terminal, which took 10 minutes, and then another 10 minutes to get through passport control. By 07:35, I’d got my bag and had cleared customs. You can read the final instalment, all about my trip into Tokyo from the airport after the gallery. There are plenty of options for getting from Haneda to the city centre. I decided to take the monorail, partly because it’s a monorail and partly because I hadn’t done much research and this route was pretty straightforward: take the monorail to the terminal station (Hamamatsucho) and from there transfer onto the Yamanote Line to Shibuya. Although I probably could have done it slightly quicker if I had changed at Tennozu Isle instead, it only took me 45 minutes as it was. While I was at the airport, I took some cash out (¥10,000, which comes as ten ¥1,000 notes; get any more than that and all you get are ¥10,000 notes, which can be tricky to change). I also got a Japanese SIM card for my phone (the alternative, if you don’t want to switch out SIM cards, is to get a portable Wi-Fi hotspot, but these are four times the price! I bought my train ticket using the cash I’d just withdrawn, although with hindsight, I’d have been better off topping up my Pasmo card which I’d bought on my previous trip. This is like an Oyster card (if you know the London Underground) and works on almost all of Japan’s urban public transport systems. If you haven’t got one, I’d recommend getting one on arrival at Haneda and then using it rather than buying a separate ticket for the monorail. It also covers the trains from Narita, although if you want to use the Narita Express or Keisei Skyliner, you’ll have to buy a separate train ticket. By 08:10 I was on the monorail for a quick, smooth ride into the city centre, with lots of stops along the way. 20 minutes later, I was changing trains at Hamamatsucho for the Yamanote Line (where I did have to pay with my Pasmo card) and after another 20 minutes I was getting off at Shibuya and, by 09:05, I was at my hotel, a mere two hours and 10 minutes after landing, which is pretty impressive. Of course, arriving at nine o’clock in the morning is not ideal if all you actually want to do is check into your hotel, dump your bags, have a shower and change. Sadly, just as had happened on my flight to Bangkok earlier in the year, my hotel wasn’t ready, so I ended up with five hours to kill before I could actually get into my room. With hindsight, I do wonder if it’s worth booking a room the night before so your room will be ready and waiting for you when you arrive… Maybe next time. And with that, I’d made it to Tokyo. It was 34⁰C and humid, and I was off to explore… If you’re interested, here’s a list of coffee shops I visited while I was in Tokyo this trip, while you can also see how I got on when I flew back two weeks later…. This entry was posted in Brian's Travel Spot, Tokyo and tagged Tokyo2018T by Brian Williams. Bookmark the permalink.